A few days ago I was browsing a used bookstore, as I am wont to do. There weren’t any Jeep-specific books, but since I had just published the first part of this series, I figured I’d look at their truck books to see what they had to say about Jeep. The first book I checked: The Complete Book of Tractors & Trucks. Since the Willys MB was basically an overgrown tractor, and since Jeep had produced quite a few trucks over the years, I thought I’d find a few interesting bits of tid. Well, bits is what I found. No trucks, but a brief discussion of the flatfender CJs. For a book published in 2003, you’d think that something more recent than 1960 would have made the cut. In fact, they were so keenly interested in Jeeps that the second paragraph ended mid-sentence. The next page moved on to a different manufacturer. Indignities. The other book I looked at, Pickups: Classic American Trucks, made The Complete Book of Tractors & Trucks look like a Jeep encyclopedia. Ford, Dodge, Chevy, International Harvester, Studebaker...but no Jeeps. This gaping hole in our cultural awareness extends to Jalopnik. During his video showing off the new Wrangler JL at the 2017 Los Angeles Auto Show, Andrew Collins asked someone off-camera whether Jeep had ever produced a full-sized pickup truck, and then decided they had not. This Gladiator and the owner’s beautiful Grand Wagoneer graced the same parking lot as my Wrangler during preparations for the 2018 Toledo Jeep Fest parade. You, my dear reader, know better. Jeep has indeed made trucks. Great trucks. Quirky trucks. Beautiful trucks. Trucks that inspire awe from bystanders in no small part because it’s a revelation that they ever existed. Jeep has the dubious distinction of always being owned by an auto company that can’t really afford to be in the auto business. (I happen to think that’s the only reason we still have the Jeep Wrangler in its solid-axle/ragtop/windshield-dropping form after all these many decades, but that too is another story.) Willys-Overland couldn’t make it alone, so Kaiser bought/merged with it in 1953. Four wheel drive and the iconic Rhino grille. Now that’s a pickup even a non-truck-guy like myself can appreciate. Kaiser produced two Jeep pickups during its stewardship of the brand: the Gladiator and a pickup version of the Jeepster Commando. Let’s take a look at each. The Gladiator arrived on the scene as the rather spartan Jeep Truck was departing. As with the Willys Wagon and Jeep Truck, the Gladiator was built on the same platform as another wagon: the Brooks Stevens-designed Wagoneer. And as with the Willys Wagon and Jeep Truck, the wagon overshadowed the truck. Perhaps the most distinctive styling element on the Gladiator was the Rhino grille. For all of their market success and passionate fan base, none of the other major U.S. automakers have ever manufactured a pickup truck with a grille so widely-admired. I mean, have you seen the feeble attempts Ford made on their F-series trucks over the generations? Besides a strong sense of style, Gladiator also launched with what was then still a rarity in the U.S. market: an overhead-cam engine (the Jeep Tornado, which replaced the Super Hurricane). Perhaps due to its unfamiliar design, mechanics of the era were not overly impressed, and it gained a somewhat problematic reputation. In 1965, foreshadowing Jeep’s next corporate transition, Kaiser started using AMC’s new straight-6 engine for the Gladiator instead. Kaiser’s relationship with AMC was further strengthened that year by offering its 327 cubic inch V8, addressing the power concerns that had constrained some earlier sales. Other distinctive options for the new Gladiator: four-wheel drive with an independent front suspension (most Gladiators, however, used a solid front axle, and IFS was retired from the Gladiator in 1965) and, entirely unique to Jeep in the U.S. market, four-wheel drive with an automatic transmission. 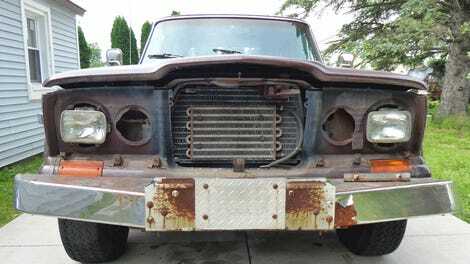 So, of the innovations Jeep brought to market with the Gladiator, most were abandoned relatively early; sadly, this includes the Rhino grille, which eventually made way for other designs while the Wagoneer and trucks still retained the front clip, as David Tracy recently documented. The Gladiator name itself did not make the cut; after AMC bought Kaiser, the marketing name was dropped, and the trucks are now referred to as “J-series” trucks, owing to their model names: J-200, J-300, ad nauseum. However, I’ll cover that in the final article in this series, covering the AMC/Chrysler years. If you’re interested in the fine details: model numbers, thriftside vs townside, technical specifications, basically anything you’d ever need for a restoration, I recommend this article from Allpar. 1949 Jeepster, included merely for its stunning beauty. Noteworthy: unlike its contemporary CJs, not only did it have a glovebox, it had a locking glovebox. If you think of the Jeepster at all, you can be forgiven for thinking of the it as a roadster...that is, if you think of the Jeepster at all. Its first incarnation during the Willys years was simply that: a two-wheel drive roadster, which didn’t particularly mesh well with the emerging Jeep brand ethos. It was and is, however, a beautiful car. Nonetheless, being underpowered and overpriced relative to its competition, it lasted but two years before Willys dropped the ax. Kaiser resurrected the marque as a four-wheel drive roadster/pickup/station wagon. The Commando isn’t nearly as elegant as the original Jeepster, but overall it’s still a very attractive vehicle. 1969 Jeepster Commando pickup, restored to its original Empire Blue paint. Or was a very attractive vehicle, until AMC got its hands on it. Again, more next on that in my next piece. The Commando was, unlike the original Jeepster, four-wheel drive, designed to compete with the IH Scout and Ford Bronco. It came by default with the Hurricane engine, but Kaiser also offered a Buick “Dauntless” V6. With its Hurricane it could go from zero to sixty in 24 seconds! What a speedster. The Commando looks and feels like a Jeep, just one unfamiliar to most people. It has the classic seven-slot grille, the CJ-style external hood latches, round headlights. It even offered power take-off, so you could plow fields or dig ditches when the mood struck you. And if you were less interested in field labor and more concerned with creature comforts, the Commando even offered a power soft top. Holy Toledo, what a car! Earlier in this piece I posited the notion that Jeep has been perpetually owned by car companies who couldn’t afford to be car companies. First Willys, then Kaiser, then AMC. And Chrysler. And FCA, although (finally, thanks to Jeep!) it seems that despite Sergio’s frequent entreaties (RIP) Jeep might finally no longer need to be a bargaining chip for a buy-out. In my next and final piece I’ll tackle Jeep pickup trucks during the AMC and Chrysler era. AMC may not have known what to do with Jeep design, but they managed to keep the brand alive, for which I’ll be forever grateful.